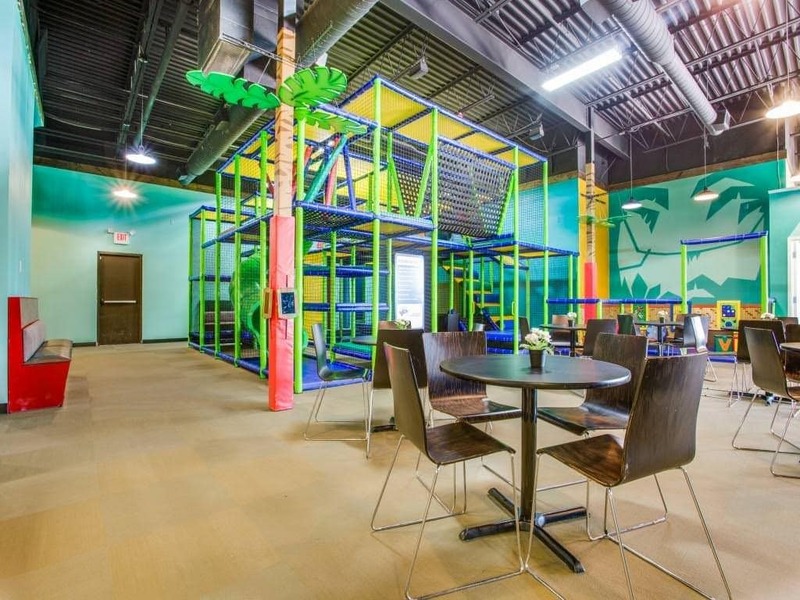 Jungle Joe’s Cafe is a local favorite indoor playspace. Wifi, comfortable seating, the delicious cafe, and an inviting, manageable play-space make it a fun Frisco destination for kids and a convenient option for parents. Jungle Joe peers around the play structure. Angela Holt, the business owner, has just left for the day. Joe leaps from his perch on the wall. First, out of habit, he runs to the front door and peeks out. Yes, Angela is gone for sure. Next, he dashes over to the camera control board. Holt has installed cameras inside the play structure so that children are never out of sight from supervising parents. Unfortunately, such supervision is no match for this sneaky little monkey’s antics. Next, Joe runs into the special room reserved for birthday parties. There was a celebration earlier that day and he’s hoping to find some leftover frosting. Unfortunately, the staff at Jungle Joe’s was as thorough as ever and not a crumb remains to testify to the earlier fun. Joe heads for the play structure. His favorite activity is tumbling over the giant soft rollers. All day long he loves to watch little visitors shriek with delight as they struggle over the big rollers – and now it’s his turn to try! Next, he spends a few minutes scrambling up the soft poles that dot the structure. Joe slips down the slide and checks the clock on the wall – he loves to race himself on his ascent and descent through the netted play structure. While the children that came to visit often take an hour or so to make their way through the maze of netting and soft rubber, Joe can race through the small structure in just a few minutes! Sometimes he wishes it was larger, like the trees in the jungle back home, but he knows that Angela has designed the structure to be smaller so that parents can feel comfortable allowing their small children to play freely. Joe’s stomach begins to rumble – he’s getting hungry! Fortunately, just like the parents who visited Jungle Joe’s Cafe during the day, Joe appreciates the convenience and gourmet offerings of the cafe. He races over to the counter and peruses a menu. Joe’s favorite dishes are hot dogs and peanut-butter-and-jelly sandwiches, but he’s trying to stay in shape, so this time he skips over the kids’ meals and snacks and considers the healthier options. Maybe a roasted veggie salad today, or a panini? Joe decides on a Mexican Power Bowl and will save the Mango Monkey Smoothie, his personal favorite, for breakfast tomorrow. By early morning, Jungle Joe has carefully cleaned up every trace of his fun evening and heads back to his perch for a nap. Angela will be in soon to prepare the cafe for the daily 10:00 am opening. Joe is excited to see what adventures lay in store for the children that will visit Jungle Joe’s that day. Are your little ones ready to get into some monkey business of their own? Summer camps will run 5 days a week all summer long. Parents can select from half-day or full-day options. Learn more about Jungle Joe’s events and camps to plan your visit.